The Academy participants emphasised that a high number of media outlets in the region does not equal plurality of views, content and sources. Although viewers can choose between plenty of channels, political and economic interests prevent pluralism of views. The participants agreed that there is a lack of qualitative data on media pluralism. Surveys are needed to evaluate both internal pluralism, with public service broadcasters to assess pluralism of content within public media, and external pluralism, to assess pluralism of views in a particular country. The Academy recommended that the public service media reach out to stakeholders, including parliamentarians, media councils and civil society, in order to better promote the role of public service broadcasters and the public service remit. Such a step would be one of the preconditions for increasing trust in and accountability of public service media, thus also helping public service broadcasters to decrease attempts of political interference. The participants agreed that a crucial aspect that hinders media pluralism is the ownership structure of the media. While most countries have legislation in place that prevents cross-ownership, media monopolies and political figures owning media, this legislation is not always properly implemented. Media regulatory bodies and anti-trust agencies should work closer together and be better empowered to monitor ownership structures and impose, where necessary, sanctions. Finally, the Academy participants concluded that clear legal provisions are needed to regulate state advertising. Public institutions, including ministries, should be required by law to make public and transparent all advertising expenditures in public and private media. There should be clear criteria for the selection of certain media for state advertising campaigns. These criteria should also take into consideration the audience share the selected media reach. The closing remarks at the Academy were delivered by Goran Svilanovic, Secretary General of the Regional Cooperation Council; Ambassador Fletcher M. Burton, Head of the OSCE Mission to Bosnia and Herzegovina; Tanja Topic, Head of the Banja Luka Office of the Friedrich Ebert Foundation; Josip Popovac, Secretary General of the European Association of Public Service Media in South East Europe; and Andris Kesteris, Principal Adviser for Civil Society and Media at the Directorate General for Enlargement of the European Commission. 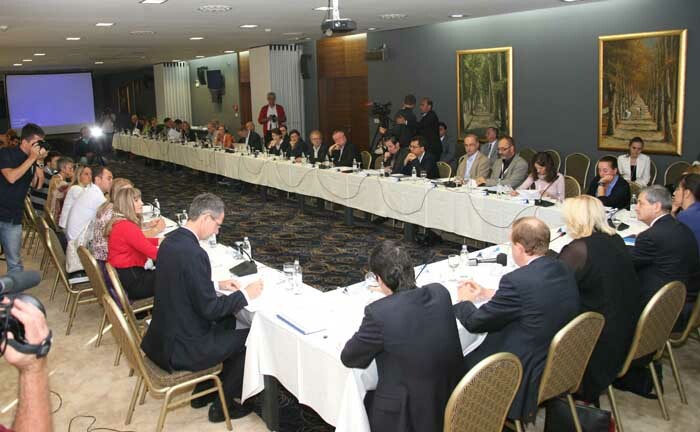 The three-day event was implemented under the auspices of the Regional Cooperation Council and in cooperation with the Friedrich Ebert Foundation, the OSCE Representative on Freedom of the Media, OSCE field operations in South East Europe, the European Broadcasting Union, the European Association of Public Service Media in South East Europe and ARTICLE 19: Global Campaign for Free Expression. The information on the Academy on Media Law in South East Europe is available at www.rcc.int. More detailed conclusions and report on the findings of the Academy will be posted at the website in the course of September. Further partners to the Academy on Media Law in South East Europe are: OSCE Presence in Albania, OSCE Mission to Bosnia and Herzegovina, OSCE Mission in Kosovo, OSCE Mission to Montenegro, OSCE Mission to Serbia, OSCE Mission to Skopje, and the US Embassy in Bosnia and Herzegovina.